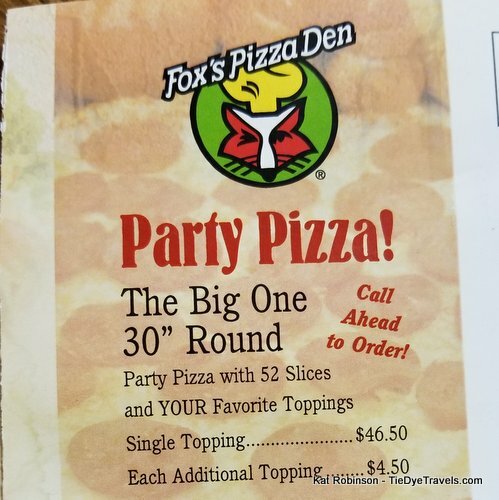 Next Time, We'll Try The Pizza at Fox's Pizza Den. We weren't out for pizza on a Sunday night in Lake Village, Arkansas, but with all other operations closed we ended up at the joint along US 65 in the southeast Arkansas town. And we have plenty of reasons to go back. He told us his name was Santa, but people call him Cowboy. He was pretty jovial, not unlike his given namesake, but in appearance he was a regular guy of Chinese descent, making sure our dishes were delivered and then taken away as quickly. 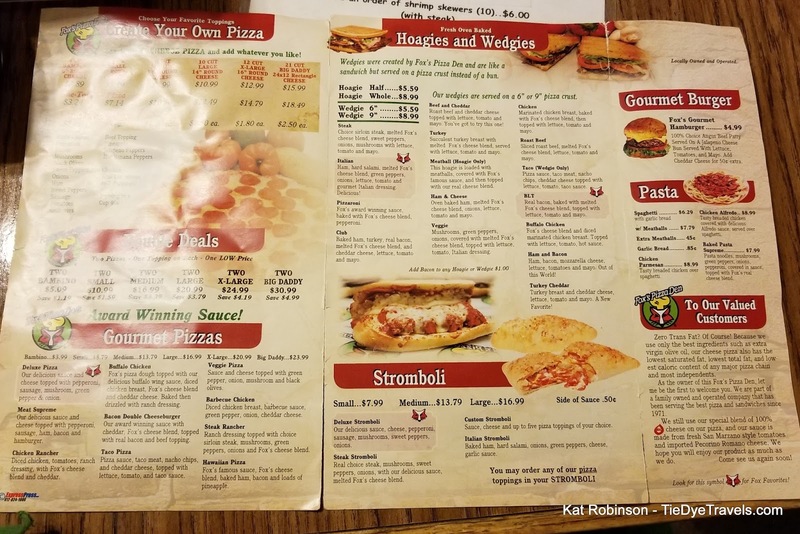 We'd ended up at Fox's Pizza this Sunday night ahead of our Monday morning shoot at the famed Rhoda's Famous Hot Tamales and Pies, where we were going to showcase the legendary Rhoda Adams for our upcoming Make Room for Pie special. Grav and I had dithered over whether we'd get something to make from the store, since the cabins at Lake Chicot State Park that we were staying in had a great little kitchen, but instead we followed "the boys" (filmmakeer Larry Foley, director Hayot Tuychiev and cameraman Chris Nunez - the remarkable team making the AETN special happen) out to Fox's Pizza for the evening. The menu was pretty intense. I'd just assumed from all the times I'd passed by that Fox's was just an old Pizza Hut that had been taken over by the shortrange Fox's chain, but I was pleased to see a variety of sandwiches and salads alongside the pizza offerings - though the idea of "wedgie sandwiches" was a little eyebrow raising. We all made our selections and watched a bit of Arkansas Razorback baseball on the tube while we waited. So... I wanted a salad. 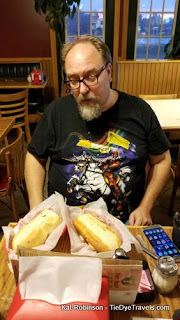 There's no real sense in keeping this a secret, but I've been doing my best to get down to my pre-Arkansas Pie book weight and I'm limiting my sweets and carbs. I was expecting a small salad with some salsa and beans and cheese. Instead, here's this gigantic bowl delivered to the table, an eight inch round packed with iceberg lettuce, chunks of tomato, a huge handful of cheese and lots - I mean lots - of seasoned ground beef. It came with a few containers of sour cream. I'd asked for the tortilla chips that normally came with it to be held as well, so I was really surprised by the bowlful. 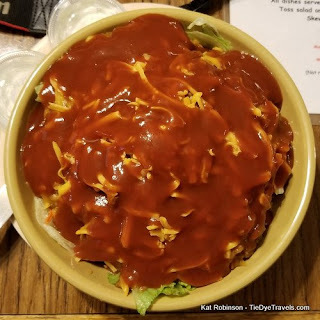 Well let me tell you what - it reminded me of what taco salads were back when I first encountered them, taco sauce covered cheddar cheese packed beauts served in melamine bowls just like this. I was happy as a dead pig in the sunshine. Grav... he came in rough. All the travel had gotten to him and he'd waited too long to eat and had a hard time figuring out what he wanted. 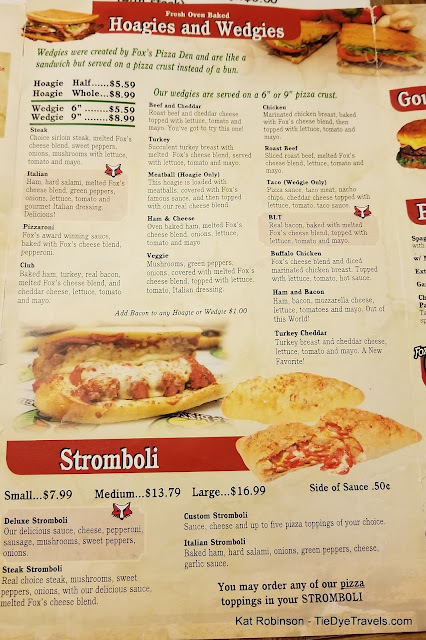 I finally told him he was getting a hoagie, and ordered him a large meatball hoagie. Santa brought him double what he wished - literally - two big sandwiches each in its own basket. He perked up, bragging on the sandwiches as he finished off the first half. Then he stopped and looked up, over my shoulder. "Kat, what's the largest pizza in the state?" he asked. "It's at Magic Springs. You remember, that 29" monstrosity we tried a while back?" "I think we need to make a correction." I looked back over my shoulder. Above the register a massive pizza box was suspended. No, it couldn't be. Santa, er, Cowboy got to talking with us a bit at the table, and continued it once we got our takeout boxes for what we couldnt finish. Turns out, he's Santa Lee, son of Arther Lee of Kowloon Restaurant down the street, one of the places I feature in Classic Eateries of the Arkansas Delta. This place is his - and the Cowboy Steaks we saw on the additional side menu are named for him, not for their cut. He bragged on the steaks a bit and I got excited. But I was also very, very full of taco salad. Grav asked him again about the pizza, and Hayot actually came over and took a photo, too. 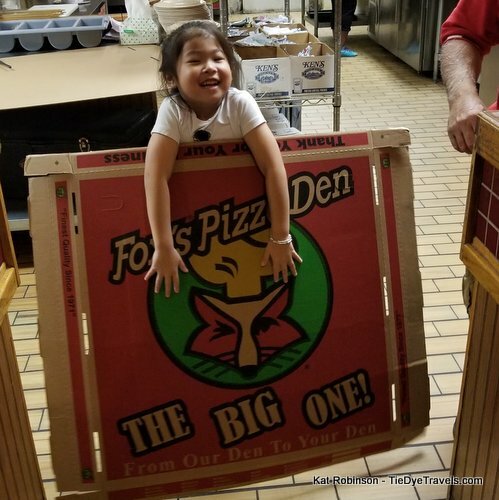 Yes, this pizza is probably the recordholder right now for biggest pizza in Arkansas. 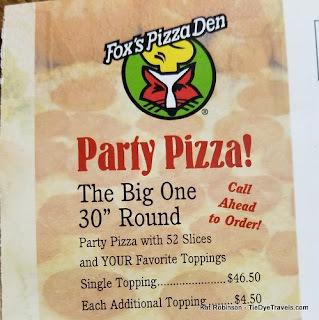 It's a 30 inch pizza. And when we come back through with a crowd, we're going to stop in and order this monster. 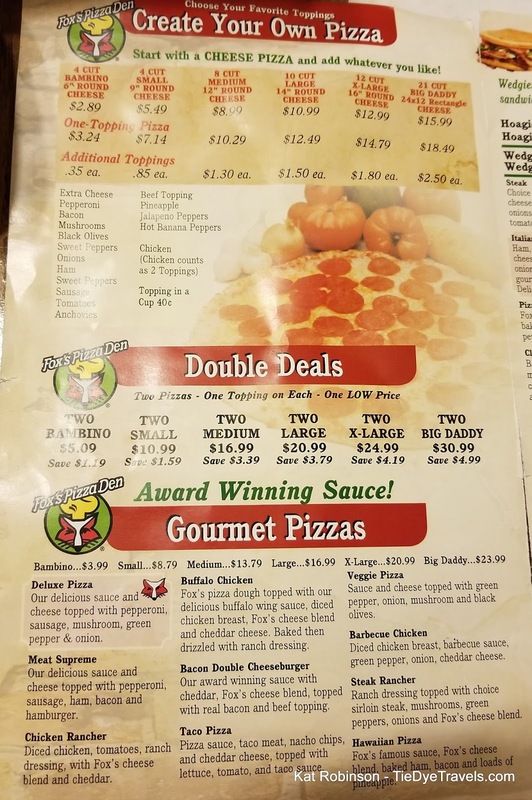 Because it's our job, sure, but also because a pizza like that deserve a crowd. 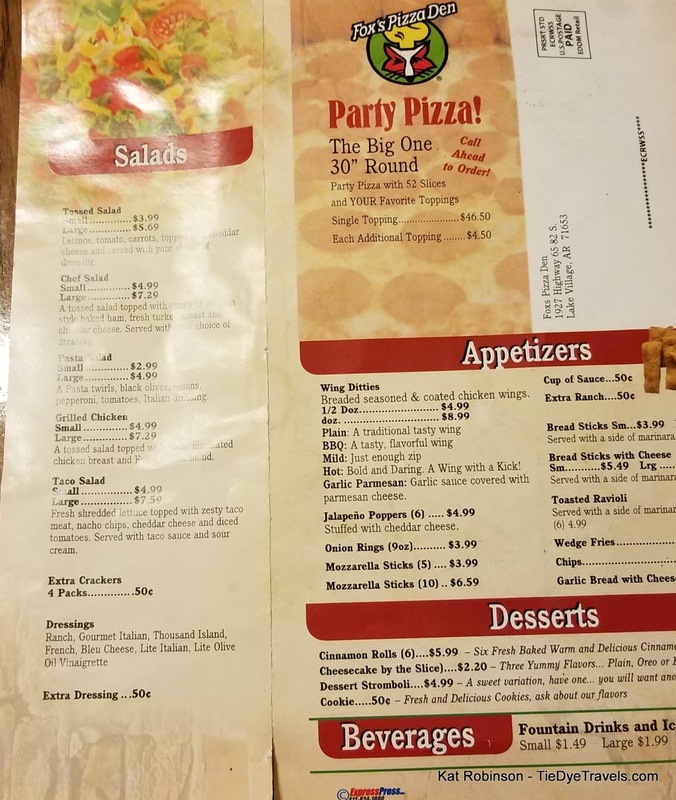 Cowboy says the pizza takes a good 20 minutes just to cook and it's square cut - and your best bet is to call ahead. I'm going to have to visit Cowboy and his family again next time I'm in town. I kinda wish I hadn't waited so long to stop in - since I've been passing by the entirety of the restaurant's six or seven years in existance. I know the portions are ample and the prices are good, and I'm eager to check out what the restaurant is known for - as well as steaks baked in a pizza oven. Adventure awaits! 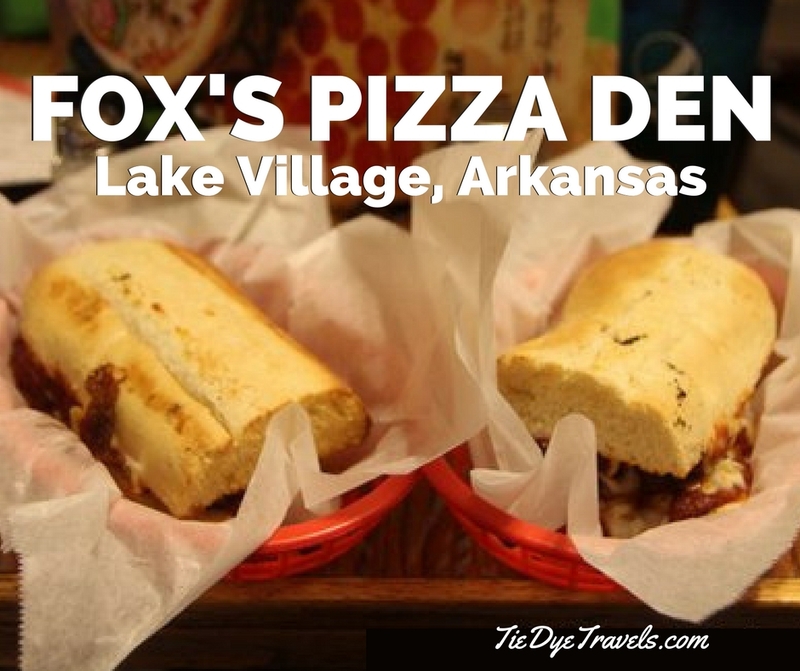 You'll find Fox's Pizza Den at 1927 South US 65 in Lake Village. Yes, readers, I am aware there are other Fox's here and there, but THIS one is the one I want to return to. 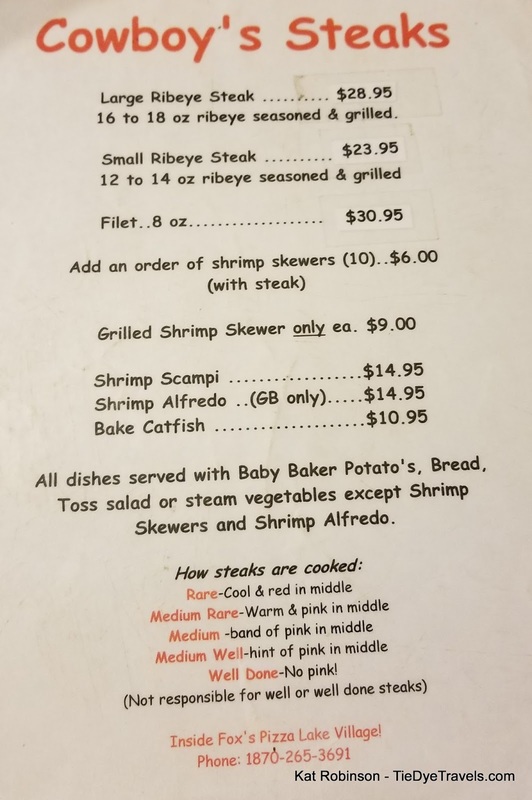 When you're planning to go, check out the menu online (steak menu posted below) and if you're doing takeout call (870) 265-3691. Click on menu sheets below to enlarge. Honeymoon in Hot Springs, Arkansas. I've Rather Lucked Out with AirBNB. 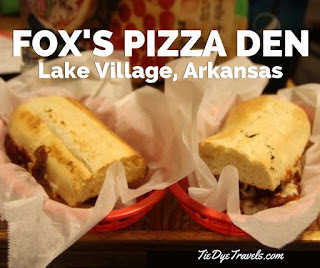 Quick Bite: The Dive in Conway.